In a collaborative study by the University of California, Merced, the University of Oklahoma, the University of Chicago and Uppsala University in Sweden, researchers conduct the first ancient DNA investigation of the Himalayan arc, generating genomic data for eight individuals ranging in time from the earliest known human settlements to the establishment of the Tibetan Empire. The findings, published on June 20 in the Proceedings of the National Academy of Sciences, demonstrate that the genetic makeup of high-altitude Himalayan populations has remained remarkably stable despite cultural transitions and exposure to outside populations through trade. The study was conceived by UC Merced Professor Mark Aldenderfer, who also directed the surveys and excavations of the sites from which the analyzed materials were recovered. Aldenderfer was joined on the project by Oklahoma Professor Christina Warinner and Chicago Professor Anna Di Rienzo. 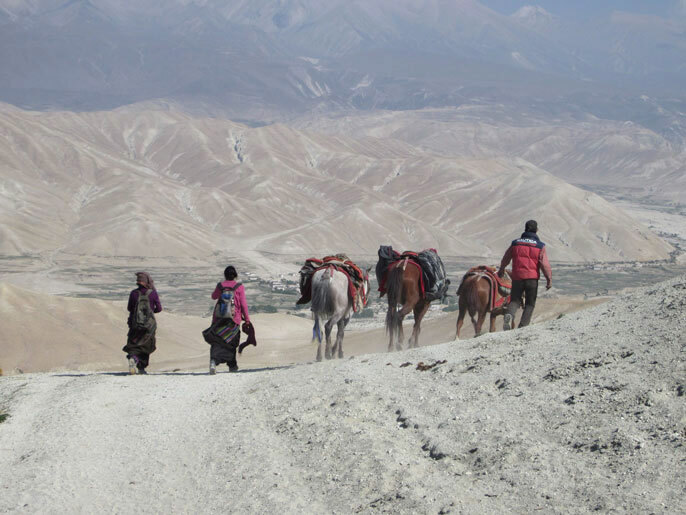 “In this study, we demonstrate that the Himalayan mountain region was colonized by East Asians of high altitude origin, followed by millennia of genetic stability despite marked changes in material culture and mortuary behavior,” Warinner said. Since prehistory, the Himalayan mountain range has presented a formidable barrier to population migration, while at the same time its transverse valleys have long served as conduits for trade and exchange. Yet, despite the economic and cultural importance of Himalayan trade routes, little was known about the region’s peopling and early population history. The high-altitude transverse valleys of the Himalayan arc were among the last habitable places permanently colonized by prehistoric humans due to the challenges of resource scarcity, cold stress and hypoxia. “Ancient DNA has the power to reveal aspects of population history that are very difficult to infer from modern populations or archaeological material culture alone,” Aldenderfer said. To address the problem, Warinner and colleagues sequenced the nuclear and mitochondrial genomes of eight high-altitude Himalayan individuals dating to three distinct cultural periods spanning 3,150 to 1,250 years before present. The authors compared these ancient DNA sequences to genetic data from diverse modern humans, including four Sherpa and two Tibetans from Nepal. All eight prehistoric individuals across the three time periods were most closely related to contemporary highland East Asian populations — i.e., the Sherpa and Tibetans — strengthening evidence that the diverse material culture of prehistoric Himalayan populations is the result of acculturation or culture diffusion rather than large-scale gene flow or population replacement from outside highland East Asia. Even more revealing, both prehistoric individuals and contemporary Tibetan populations shared beneficial mutations in two genes, EGLN1 and EPAS1, which are implicated in adaptation to low-oxygen conditions found at high altitudes — but EGLN1 adaptations were observed earlier. The study broke new ground in other areas as well, yielding the first ancient whole genomes of East Asian ancestry and the highest-coverage ancient human genome from Asia sequenced to date. The research was supported by the National Science Foundation, the National Institutes of Health and the University of Chicago Comprehensive Cancer Center Support Grant, with particular support from the Genomics Core Facility, National Geographic Society, Henry Luce Foundation, Samsung Scholarship, The North Face and Field Museum.